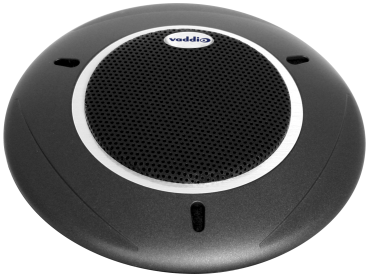 Designed for collaboration and conference room applications, the EasyMIC Table MicPOD is based on Vaddio’s SmartMIC technology, a simple and less expensive approach to adding live audio conferencing to meeting room designs. SmartMIC technology is the industry’s first microphone system to incorporate digital signal processing (DSP) and echo cancellation directly into the microphone itself. The internal DSP features microphone gating, equalization, AGC and noise cancellation. With SmartMIC technology, internal DSP and echo cancellation can now be integrated into any manufacturer’s audio mixing system. Each EasyMIC Table MicPOD is equipped with an array of three electret condenser microphones positioned to form a 360-degree pickup pattern. This unique technology is based on the microphone’s ability to actively manage the room’s live audio for gain, gating and echo cancellation. Once detected, the microphone will adjust and mix down to a single output. Because the intelligence is inside the microphone, any mixer can now be used in a live collaboration application for audio conferencing and achieve outstanding results.